A lovely way to keep plants healthy - no more dried-out plants! Do you worry your plants will dry out while you’re away? Here’s an easy way to keep them moist and healthy! Simply fill these glass globes with water and push the stems into the soil so the roots can absorb the moisture they need. 24 or 25cm tall and supplied in a set of four, the cute bird, mushroom, snail and owl designs will also add a decorative touch to your indoor or outdoor pots. Mushroom: 10 W x 7 D x 25 H cm. Always be aware that glass can become dangerous if improperly handled. Follow all instructions below whenever this product is in use. 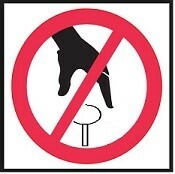 Do not push the globe into soil in by gripping the head. Always use the stem to insert into soil! Always use protective gloves like gardening gloves. Always carry each item with both hands to avoid dropping or bumping them. Carefully fill using a small water stream from water tap. Always use the glass stem to push water globe into soil. Never use the top bulb to push down! Never force the glass stem into hard soil. Loosen soil with a fork or trowel or use a pencil to make the initial hole in the soil before trying to insert glass. Be gentle and slow when inserting the stem. Applying too much force to the glass may cause damage to the item and possible injury. Do not rock glass stem back and forth to force stem in to soil as this may cause the stem to break. Appropriate gloves should be worn where there is a risk of breakage. When drying glassware, place globes on towels, lined basket, or slip-resistant pads. Be sure to place away from the edge of the bench. In case of glass breakage use mechanical means to pick up the pieces such as a broom and dustpan or vacuum cleaner. Tongs should be used to pick up large pieces of broken glass. Small shards can be picked up using a wet paper towel or absorbent pad or by using rolled-up tape. Broken glass may be disposed of in a cardboard box. Love these. I use these outside.I have sandy soil and they work! Look great. I have been purchasing items from Innovations for a number of years. I have never been disappointed, nor have I had to return anything I bought. I do all my Christmas shopping without having to leave the house! Love my decorative glass plant watering globes. Thank you, Innovations. Love these glass watering globes, hard to fill but look lovely anyway just sitting in the pots. looking great in my into/outdoor pots. Saves checking them frequently to see if they need water. I love these 4 beautiful Watering Globes, they not only look lovely in my favourite indoor plants but I can stop worrying about them getting enough water. I am going to order another set when I put in my next Innovation order. So delighted with the professional timely services from ordering t delivery. Quality of the watering globes is excellent and can already see improvements on my plants, summer will stress them less this year - thanks Innovations. Great idea especially if you’re away for a few days. This was my second lot that I bought for my daughter.